The title and cover art for Carrie Underwood's upcoming CD have been revealed. 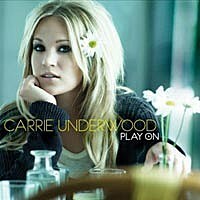 'Play On,' the country superstar's third album, is due in stores Nov. 3. November will be a busy month for Carrie. She's also set to co-host the CMA Awards with Brad Paisley, the week after her new album comes out. The two co-hosted together for the first time last year. "I would appreciate it if he [Brad] asks me permission before he tries on all my dresses this year," Carrie jokes. The first single from 'Play On' is expected to be revealed soon.